Whether it's for yourself or for a friend, you should definitely bring some souvenirs home from Tokyo. Here is a list of my favorite Tokyo souvenirs and where to buy them. Tokyo is THE place to buy traditional and modern Japanese gifts. In this section, I’ve listed the best souvenirs you can buy in Japan, divided into easy-to-follow categories. If you can’t think of the perfect gift for someone back home, just skim down this list. After each description, I list the best place(s) in Tokyo to buy these things. Click to the links for full details and maps to each place. Oriental Bazaar: This Harajuku art and craft emporium has a big selection and English-language service. Tokyu Hands: With locations across Tokyo, including a big branch in Shibuya and an even bigger one in Shinjuku's Takashimaya Times Square complex, this is a must for gadget fans. Loft: This huge youth-oriented department store in Shibuya is one of my favorite places to buy creative goods for the folks back home. Mandarake Complex: Mangas are only the beginning of the offerings at this Akihabara shop. Don Quijote: For food items, makeup, curious, novelties and lots of other cool stuff, try this huge superstore in Akihabara. Uniclo: You'll find branches of this casual clothing retailer all across Tokyo. My favorite is the huge branch in Ginza. Daimaru Tokyo Station Branch: On the first floor, easily accessible from the Yaesu Central Exit of Tokyo Station, this collection of Japan's best sweet shops is a good place to pick up some delicious sweets before leaving for the airport. They have both traditional Japanese and Western sweets. Kuroeya: This lacquerware specialist north of Tokyo Station is one of my favorite shops in Tokyo. The selection is astounding and they have cool things like lacquerware phone cases. Bingoya: In East Shinjuku, this shop offers six floors of traditional arts and crafts to choose from. Oriental Bazaar: This convenient and foreigner-friendly shop right on Omotesando in Harajuku is a great one-stop shop for traditional Japanese souvenirs. 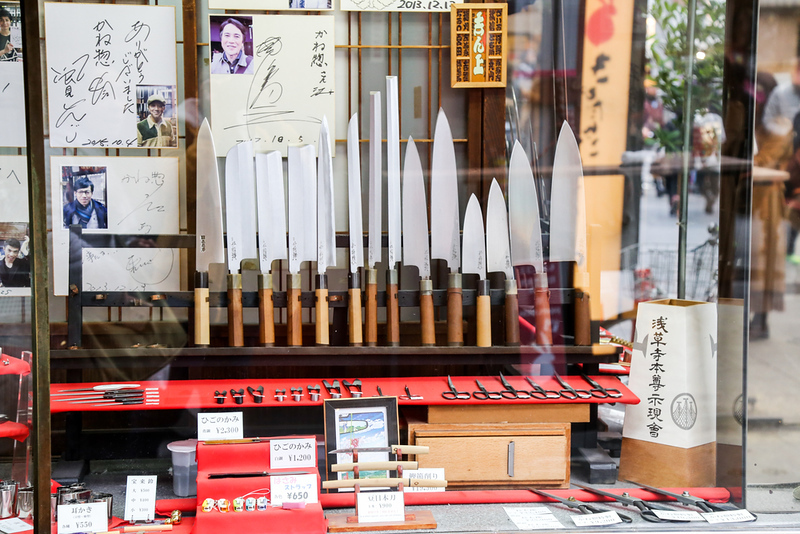 Kiya Knife Shop: This Japanese knife and cooking equipment shop within easy walking distance of Tokyo Station is the best place in Tokyo to pick up a knife. Blue and White: This small shop in Roppongi has a fine selection of aizome clothing and household items. Kyukyodo: This fine Ginza shop sells a great variety of Japanese art and craft-related products, including a good selection of washi and things made from washi. Itoya: This vast stationary store in Ginza is a great place to purchase modern or traditional Japanese stationary, including washi.